Soaps and Such is an interactive destination shop located inside an old historic bank in downtown Alpena. Create your own lotions and potions at the hands-on Fragrance Bar, browse through the all natural handmade beauty products, or find that perfect and unique Michigan themed gifts including handcrafted jewelry featuring the bridge or local lighthouse only crafted and sold in this shop. Sanctuary Ladies Perfume or Shipwreck Cologne for Men that sports the "Defiance" local shipwreck on the bottle. 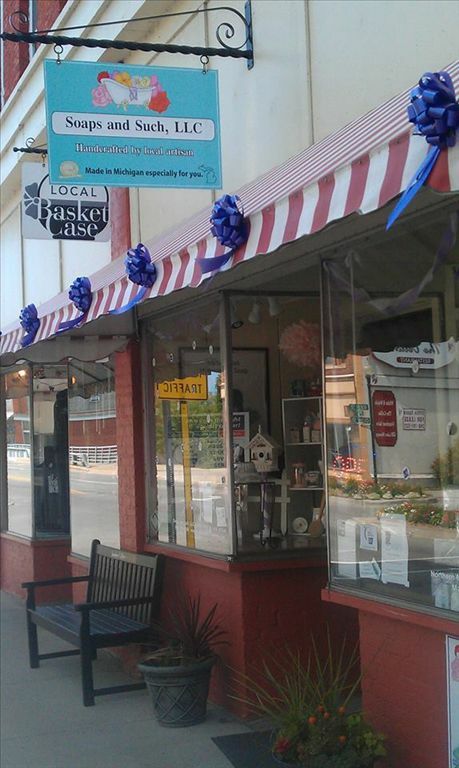 The bridge and Michigan wildlife adorn artisan crafted candles, jewelry, key chains & More. The products are artisan made and packaged on site from artisan soap, to men's cologne, to natural insect repellent to mineral makeup. The Bath and beauty line and new cosmetic line all crafted with natural ingredients the focal point including aluminum free deodorant and lots of handouts on cosmetic safety and hazards in the beauty industry. Visit the historic 1920s Maltz Bank Vault with exhibit - FREE. The vault ventilator is really neat. Schedule a private crafting session like making your own salt scrub or a pretty pedicure party. Adjacent workshop and annex to shop seats 20 comfortably at tables, 40 seated, or 60 standing. Great for demonstrations, small parties, crafting sessions, or education sessions. Visit the Web site or call for more details. 10-5:30 Mon. - Fri. Open until 7 pm on Friday. Creative Artisan Mixes History, An Interactive Experience, Unique Michigan Products, Bubbles and More to create a destination shop nestled on the shores of Thunder Bay. You won't want to miss this!